Steve — Judy and I have been at our winter home in SMA Mexico since the beginning of the year. We've rejoined San Juan de Dios Church for the season because it has a lively "Gringo" community with people we've come to love. 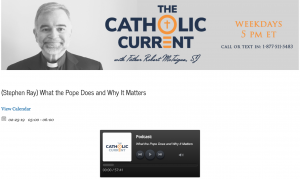 I've listened to both interviews that you posted that relate to your new book "The Papacy – What the Pope Does and Why it Matters". I particularly liked the first one with Fr. McTeigue. You've helped me get passed the disappointment I've been experiencing with Pope Francis and his unresponsiveness, side-tracking, his focusing on things he's not qualified to talk about while avoiding issues he should be addressing. I'm sure I will enjoy the book. I'm circulating your interview to several of my friends down here. Greetings to Janet. STEVE RAY HERE: Rick, thanks for your nice note and I did pass your greetings on to Janet. Please send our greetings to Judy. 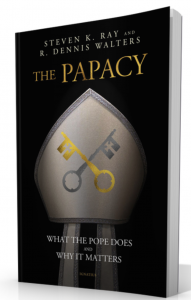 My book on the papacy was meant to give a job description For the position. It is not about Pope Francis or any other Pope. Rather, it is a job description by which you can judge any Pope as to how well he’s doing his job. This pope, I’m afraid would get low marks. On page 132 of the book I dealt with the issue of “is the pope beyond criticism?” I also deal with the issue in a pretty straightforward way suggesting, or rather saying, that the church is not doing us any favors in their current position with Islam.